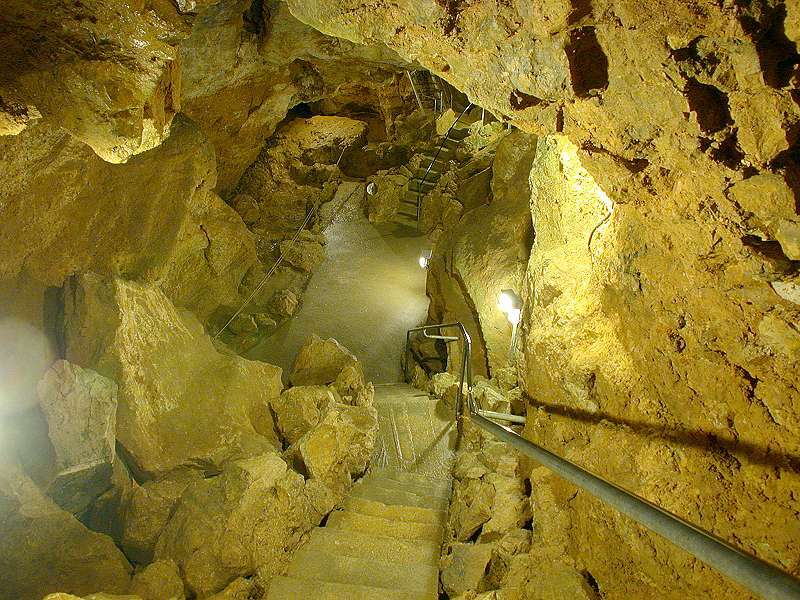 Image: a tour in the show cave Laichingen Vertical Cave, Germany. 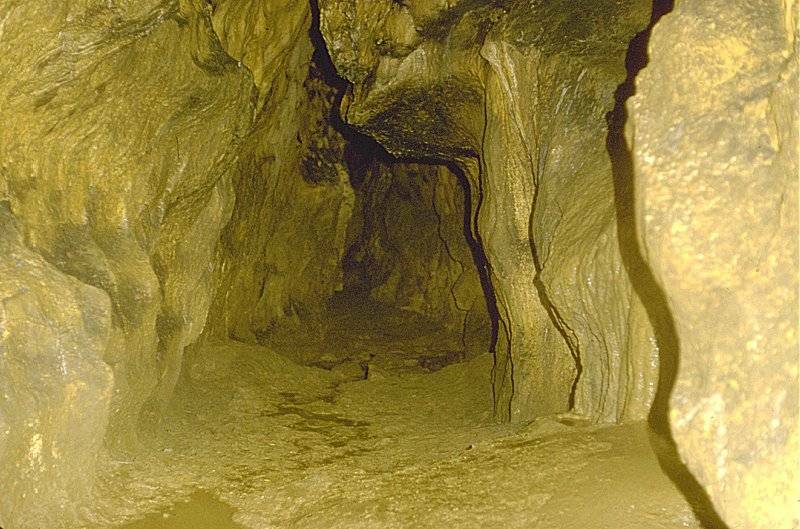 Caves are natural voids underground, large enough to be visited by man. This site is specialized on easy and comfortable to visit caves! 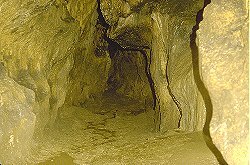 Most comfortable are show caves, where paved paths and electric light allow everybody to discover the beauty of the underground. The Greek letter Omega is the symbol for caves, you will find this symbol many times on this site and it allways means a natural cave. Image: an easy to visit "wild" cave: Schiller Cave, Germany. Show Caves are caves which are open to the public. This sort of caves are also called commercial caves or tourist caves. They have (electric) light, comfortable paths, guided tours and open hours. You will have to pay a fee. Those are the caves visited by tourists. They have no light and no regular guided tours, but you need little equipment like good shoes and light (electric torch) to visit them. Some of those caves are even part of a trail, a public footpath, or there is some sort of inofficial trail through the cave. Nevertheless, you should read the comments about spelunking and use your brain when visiting one of those caves. Some caves are extremely interesting, or provide a superlative of some kind. Some have a famous history, others contain extraordinary speleothems. All of them are generally not open to the public and most of them are dangerous. Many cavers try to protect the caves and the naive visitor by concealing informations. We have choosen an alternative: we use our cave description to explain, why it is not a good idea to visit those caves, and we try to answer all the questions of interested people with our page, hoping to satisfy your curiosity. Please refrain from entering those caves! Speleology, the geology of caves.